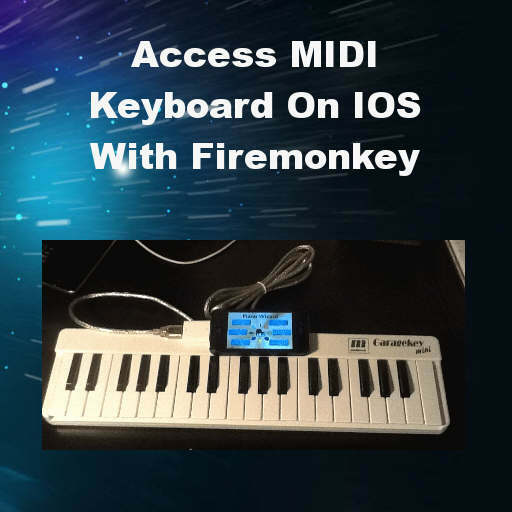 Developer Pavel Jiri Strnad has a post up on his blog on how to access a MIDI keyboard using Delphi XE5 Firemonkey on IOS. He wrote a special translation utility to convert Apple .h (header) files to .pas files. There are four converted header files that he makes available and they are CoreAudio, CoreMidi, AudioUnit, and AudioToolbox (you can access those 4 files here). He used the Ipad Camera Connection Kit to connect the MIDI keyboard to an Iphone device and then used the CoreMidi library to talk to it. The keyboard gets it’s power from the Ipod via the USB cable.He then translated some Obj-C code to Object Pascal which gave him access to the keypresses from the MIDI keyboard. The code snippet for accessing the MIDI keyboard device is available on his site for free. The code should probably also run without too many changes on Delphi XE6 and AppMethod. Head over and check out the full blog post plus source code for accessing a MIDI keyboard with Delphi XE5 Firemonkey.